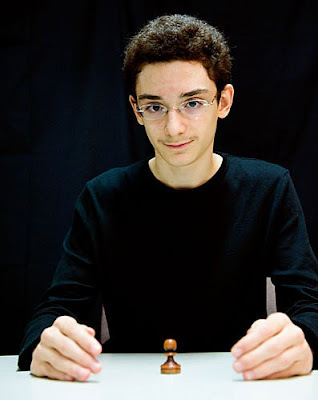 Fabiano Caruana is an American-Italien chess grandmaster and achieved his first and second GM-Norms in March and April 2007 and his last GM Norm in July 2007 at the First Saturday-Tournament in Budapest aged just 14 years, 11 months and 20 days and became one of the youngest grandmasters of all times. He is now at his rating peak, with even more points to arrive from events yet to register. His rating rose over 600 ELO points in a span of 6 years or so! Caruana was born in Miami, Florida on 30th July 1992. His family moved to Brooklyn, New York on 1996 and his parents signed him at chess club because young first-grader just couldn't sit still. Up to the age of twelve, he lived and played in the United States, with occasional travel to European and South American tournaments and at age 12 he relocated with his family from Park Slope, Brooklyn to Madrid, Spain to pursue chess in a more serious manner. He trained first with International Master Boris Zlotnik in Madrid, and later with Grandmaster Alexander Chernin (his current trainer) in Budapest.